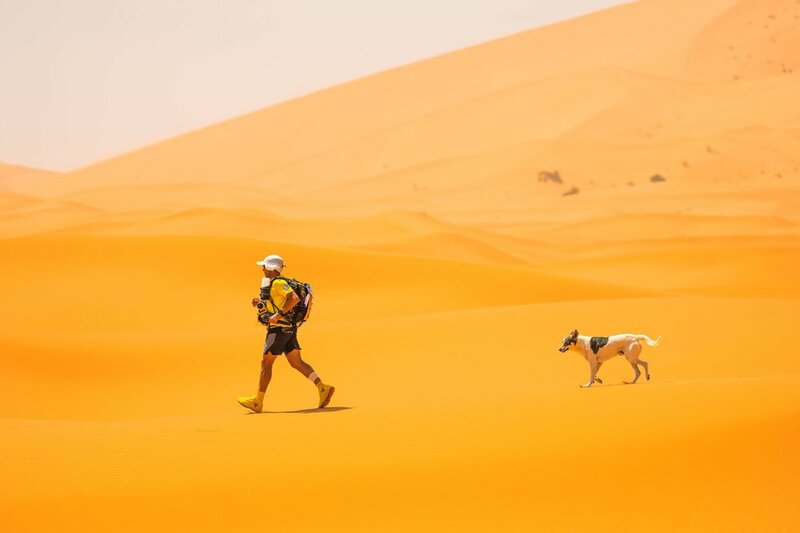 The Marathon des Sables, the original desert ultra held each year in southern Morocco, is being staged for the 34th time in 2019. It is a six-stage race run over seven days and over a total distance of approximately 250 kilometres. Medical care and (rationed) water are provided at checkpoints and at the camps, but otherwise competitors must be self-sufficient, which means carrying their food, equipment and bedding for the whole of the week on their backs. More than 20,000 people have run the Marathon des Sables since it began in 1986 - in 2019 there are around 800 competitors. For many runners, the MdS is such an adventure that they describe the experience of the race as life-changing. Photos courtesy Cimbaly Marathon des Sables. And follow competitors along the course through live tracking. …and other surprises. It was the last competitive stage of the Marathon des Sables 2019. A dog, Cactus, has joined the race. Here event inspirer Patrick Bauer congratulates him after he finished Day 4. …and to attend to brutalised feet. The leaders managed to finish the stage in less than 10 hours, but most competitors ran and walked into night. They have 31 hours to complete the leg, till the early afternoon of the following day. The Long Day, Day 4 of MdS 2019, ran near the Morocco-Algeria border through desolate terrain - baked earth, gravel plain, some sand dunes - and a sand-storm. Day 4 is the long day, around 80 kilometres or nearly a double marathon and a long and even lonely haul. Competitors have 31 hours to complete the distance. There is a rest day tomorrow. Day 3: After dune day on Day 2, competitors might have hoped to be spared the sand, but the 37km course had tall dunes as well as rocky plains and wadis. The competitors are now in the far south of Morocco and the remote and desolate nature of the desert, and its majesty and cruel beauty, are clear to see. Day Two: The second stage of MdS 2019 was dune day, with approximately 13 kilometres among the huge Merzuga sand dunes. Dunes are hard to run in, of course, but they also radiate heat, making it extremely hot. After the dunes there remained a 6 kilometre run to the end of the 32 km leg among the date palms and over the rocky surface of a wadi to the third camp. Day One: The first stage of the Marathon des Sables 2019 was 32 kilometres long and the 800 competitors ran through terrain typical of the south-east of Morocco – the vast expanse of gravel plain is broken by wadis – dry river-courses - and by small sand dunes. The temperature on Day 1 was in the high 20s centigrade. Dutch runner Ragna Debats took the lead in the women’s race, finishing 25 minutes ahead of her nearest rival. 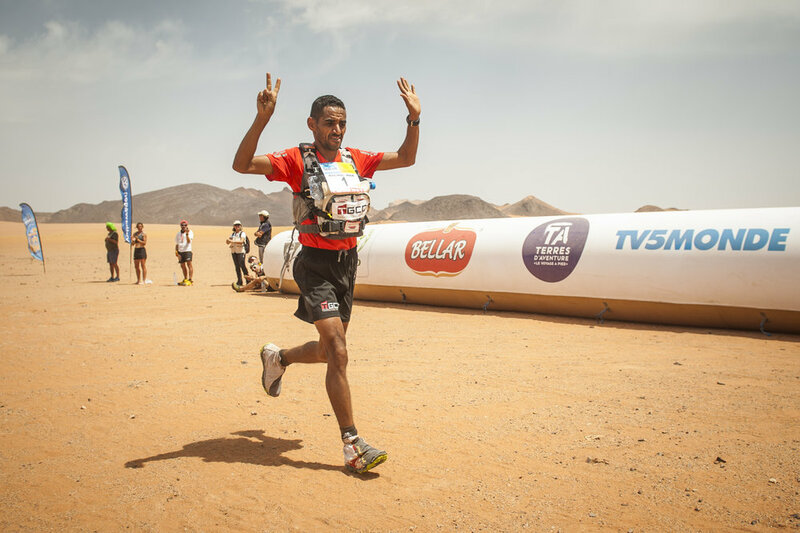 The leading male runner is Moroccan Rachid El Morabity. Day Zero, is spent in the first camp verifying gear. Competitors must carry a list of mandatory equipment, including compass, whistle and survival blanket as well as all their own food and bedding. It’s a nervous day. The competitors simply want to get going, to start the running. On the other hand, the hours of enforced inactivity offer a chance to get to know your tent-mates. Tents are made from hessian material supported on pegs with a carpet to lie on. They provide no warmth - and the desert can be cold at night - but they do offer shade from the desert sun. Usually there are ten competitors per tent. Your tent-mates are a key part of the MdS experience. Day Zero minus One. The 800 or so competitors for the Marathon des Sables 2019 arrive in Ouarzazate in southern Morocco and are transported to the first campsite in the desert near Erfoud.